And I have the most festive cookie to share with you today. It is no secret by now that I LOVE a chocolate mint flavor combo. I’ve used this combo to make other cookies, mochas, and even muffins. I absolutely love the two flavors together. You’ll never see me turn down a peppermint patty, for the record. And this time of year, when everyone seems to embrace it for the holidays, I am in heaven. 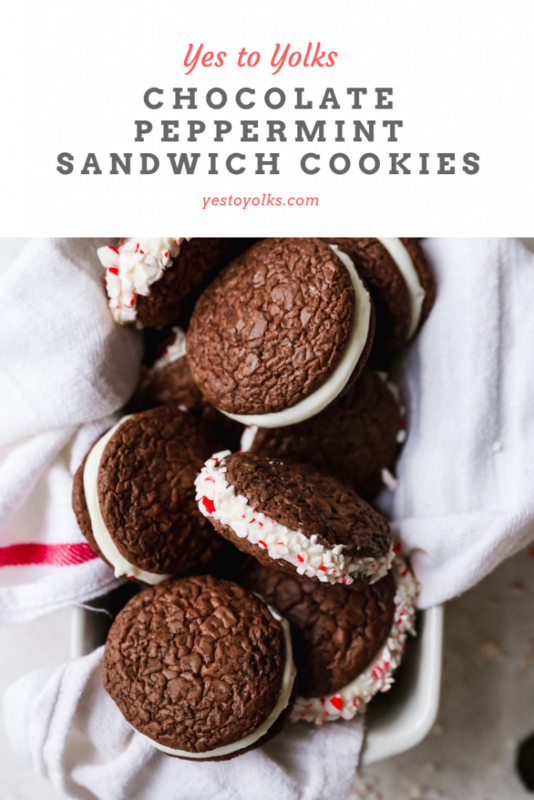 These chocolate peppermint sandwich cookies are my new favorite thing. 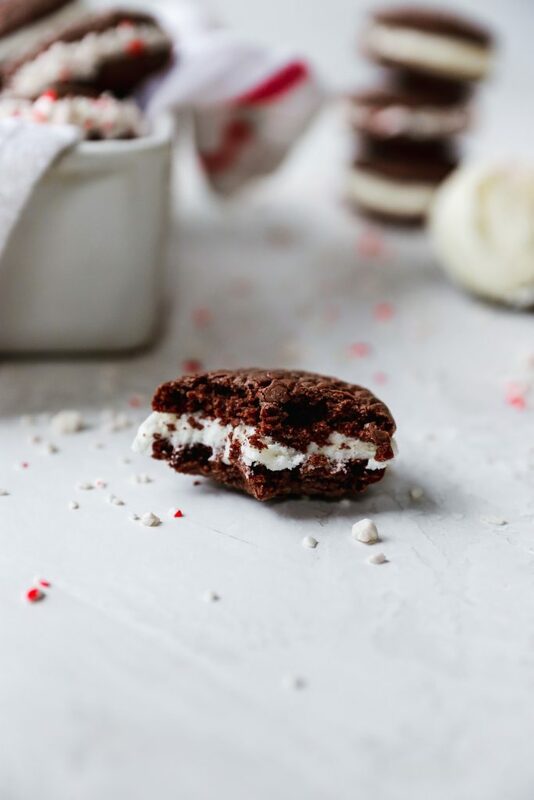 Not only do the cookies themselves have the most amazing texture and flavor, but the peppermint filling is like biting into a sweet, fluffy, minty cloud. The cookies themselves also have a mintiness, but they really drive home a rich, fudgy chocolatey bite. 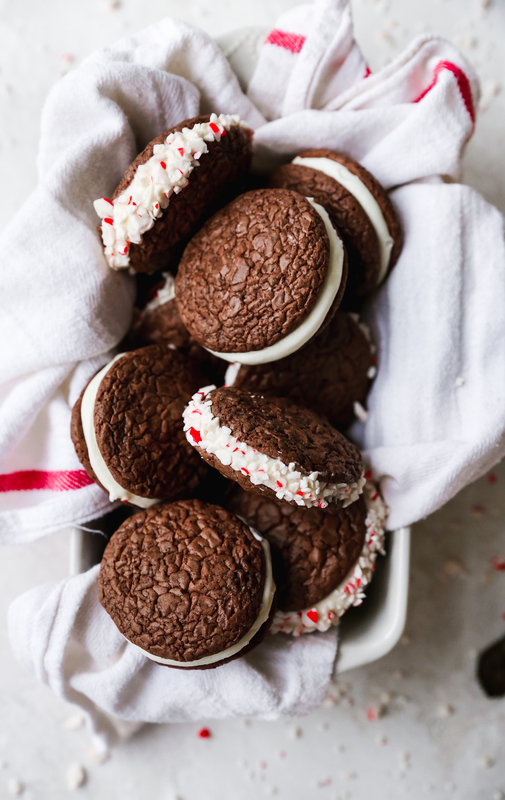 They’re incredibly soft with a nice chew, and the texture kind of reminds me of a whoopie pie! 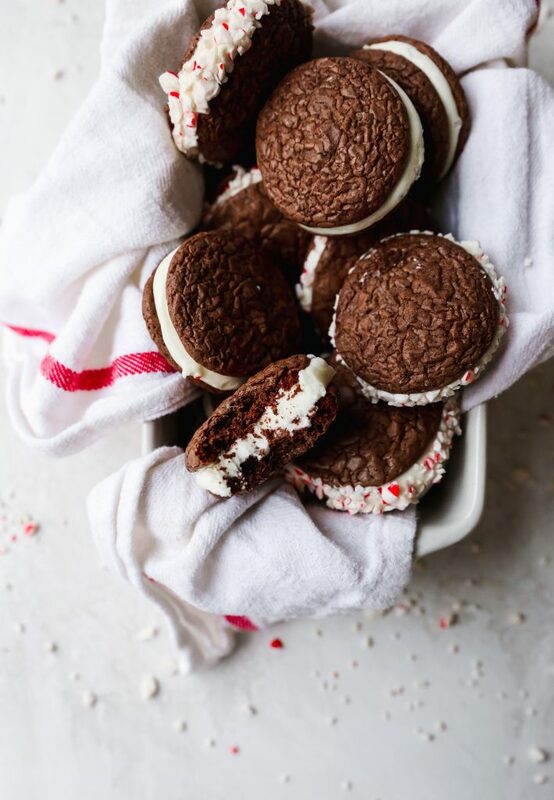 Like, a fudgy whoopie pie. 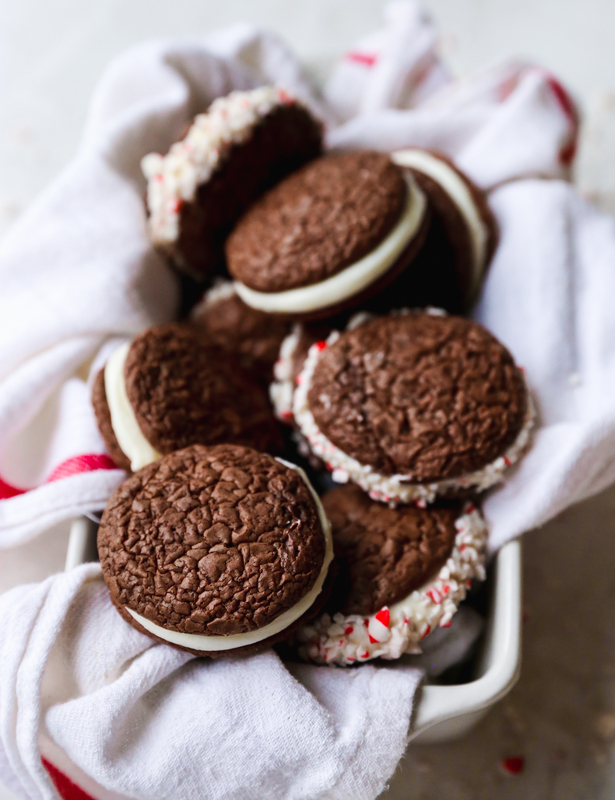 A peppermint patty whoopie pie! Yes, that is the perfect way to describe these little bites of love. The cookies and filling can be made together or separately in batches, as your life permits. These cookies are super soft and will hold up for several days if well wrapped in an airtight container. So, if your busy schedule requires you to break up the baking and assembly of these cookie sandwiches, the recipe is very forgiving that way. I made the cookies one day and the filling the next. I assembled them quickly by simply spooning the filling onto the cookies (but you can pipe it on if you feel the need). To take the festiveness to the next level, feel free to roll your formed sandwiches in crushed candy canes. I did half rolled, half unrolled and loved both versions. The unrolled cookies are completely soft with the best squish, and the rolled ones, as you can probably guess, have a fun crunch! I don’t know if I can pick a favorite. One thing of note that I think is very important when working with mint extracts (and get ready, because I’m going to channel my inner Ina Garten now): please, I beg of you, use a GOOD QUALITY mint extract! 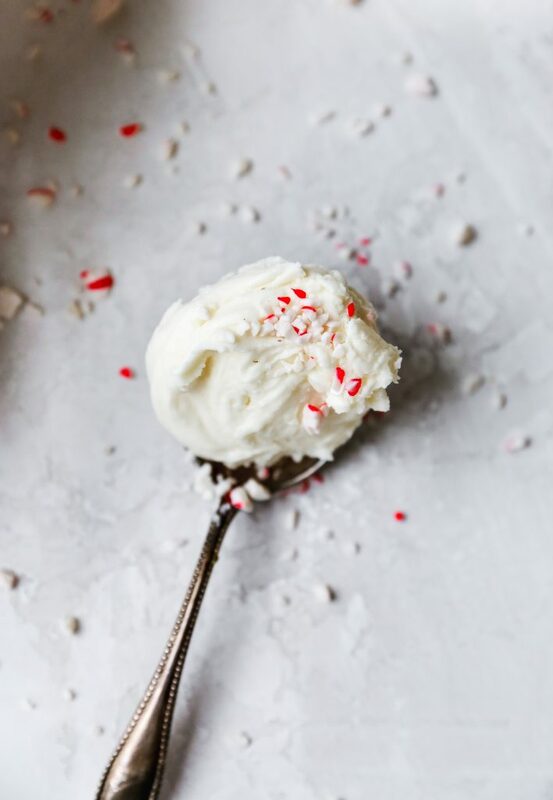 Pure mint or peppermint extract from a reputable baking brand is the way to go. Otherwise, you risk these cookies (and anything else you add it to) tasting like toothpaste. Remember, we’re going for a peppermint patty feel here. Not toothpaste. 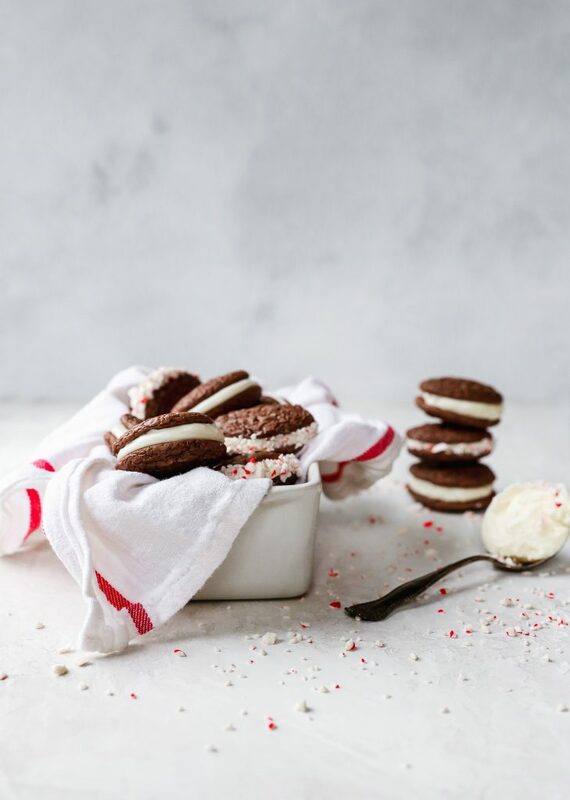 These are the perfect cookie to include in your holiday baking plans, whether you’re making cookie platters, doing a cookie swap, or looking for an edible gift idea. They scream “HOLIDAYS!!! !” and taste like a dream. The only problem is how fast they disappear. I miss them already. Preheat the oven to 300°F and line a baking sheet with parchment paper. Set aside. In a small bowl, combine the chocolate and the butter. Microwave on low for 1 minute, stopping and stirring the mixture every 15 seconds. Stir until completely melted and smooth. Set aside. Whisk together the flour, baking powder, salt, and cocoa powder. Set aside. Using a stand or hand-held mixer, beat the eggs, sugar, water, vanilla, and mint extract on high until well combined and frothy. Pour in the melted chocolate mixture and mix to combine. Add the dry ingredients in batches, mixing after each addition. Using a small ice cream or cookie scoop, scoop out the batter and place on the prepared baking sheet. Bake for 18 minutes or until the cookies have puffed slightly and cracked. They will deflate slightly as they cool. Cool completely. 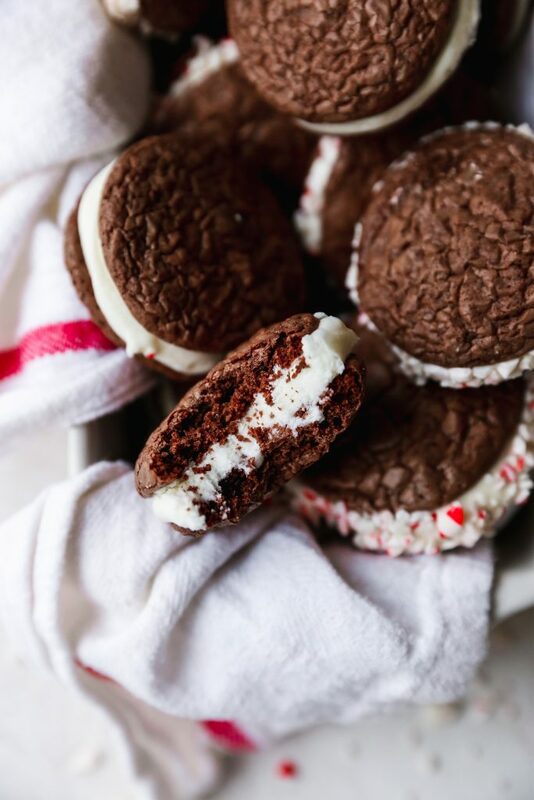 While the cookies are baking, make the filling by beating the butter and cream cheese until light and fluffy. Add the powdered sugar and beat the mixture until incorporated. Add a pinch of salt and beat again. The filling should be light, fluffy, and smooth. Spread about 1 tablespoon of the filling on the flat side of a cookie and then top with another cookie, pushing down slightly so the filling goes to edges of the cookies. You can spoon or pipe the filling – whatever is easiest! 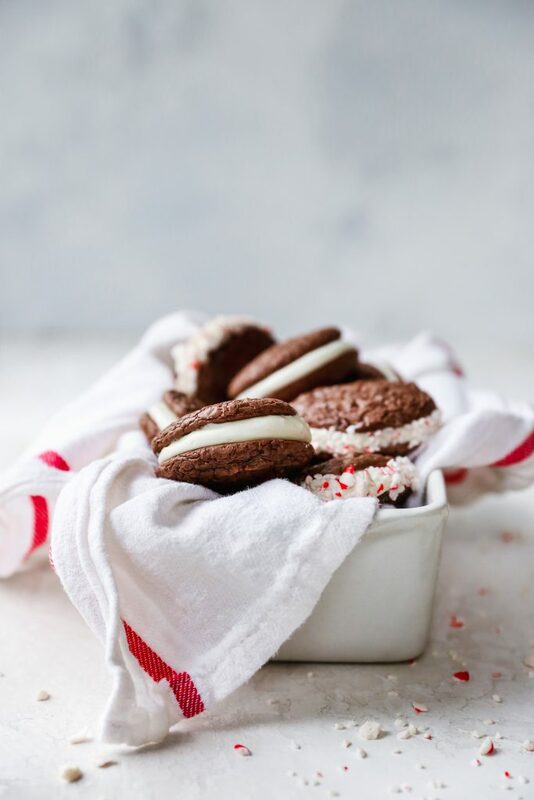 If desired, roll the sides of the sandwiched cookies in crushed candy canes so they adhere to the filling. Continue until all cookie sandwiches are made. Store in an airtight container for up to a week.